Fighting for you and your family while minimizing tension and anxiety is what the Ramos Law Group, PLLC, does exceptionally well. 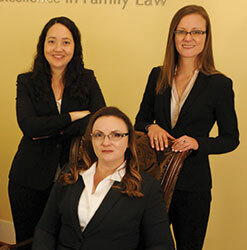 From adoptions, divorce litigation and child custody to high-asset property division and more, Mary Ramos and her team of experienced attorneys will do whatever it takes to protect and advocate for their every client in all aspects of family law. Board Certified in Family Law by the Texas Board of Legal Specialization, Ramos has more than 12 years of experience in a field she’s passionate about. “From the first time I stepped into a family courtroom, my role as a family law attorney was clarified. I couldn’t see myself doing anything else with my life. Few people get the opportunity to do what they love every day, and I am blessed in being able to pursue my dreams as an advocate,” she says. Ramos and her highly skilled associates, Julie Rosete and Lindsay Lewis, also H Texas Top Lawyers, are firm believers in continuing education. To that end, the team is active in various legal organizations, with Ramos maintaining membership in the Texas Bar College, which warrants four times the education requirement for all attorneys. Membership is an honor bestowed to less than 10 percent of Texas attorneys.